Basically – Worm tubs have the vapour in the worm/ the copper pipe, and the water in the tub. Shell and Tube condensers have the vapour in the tube and the water in the copper pipes. At the end of the lyne arms which come off the top of the stills, we find condensers or worm tubs. Both these condense steam/vapours coming off the stills, back into liquid. They do it in different ways. A worm tub is a wooden or metal tub constantly filling with cold water to cool the worm or serpent of copper filled with vapour, which spirals from the end of the lyne arm through the tub. As the vapours travel through the worm they are cooled by cold water flowing around the worm. Worm tubs give the vapour less copper contact – there is shorter length of worm for the vapours to travel through, before condensing back into liquid and pouring through the spirit safe. In condensers, the vapours pour out the lyne arm into the big tube space of the condenser from the top and cold water fills all the thin copper tubes from the bottom. This way the colder water hits the colder vapours, and the slightly warmer water deals with the vapours as they come out of the lyne arm. There can be 50, maybe 100, thin diameter copper pipes containing cold water in a condenser, for vapours to react with. In the past all distilleries used worm tubs but in the late 60’s, early 70’s most distilleries changed to using Shell and Tube Condensers. Only about 15 or so still have various worm tubs. Worm tubs allow a “meatier”, sometimes more complex, heavier spirit. Ardnahoe, Islay’s newest distillery will have 2 worm tubs – and what is believed to be the longest Lyne arms in the industry… this dram will be interesting! 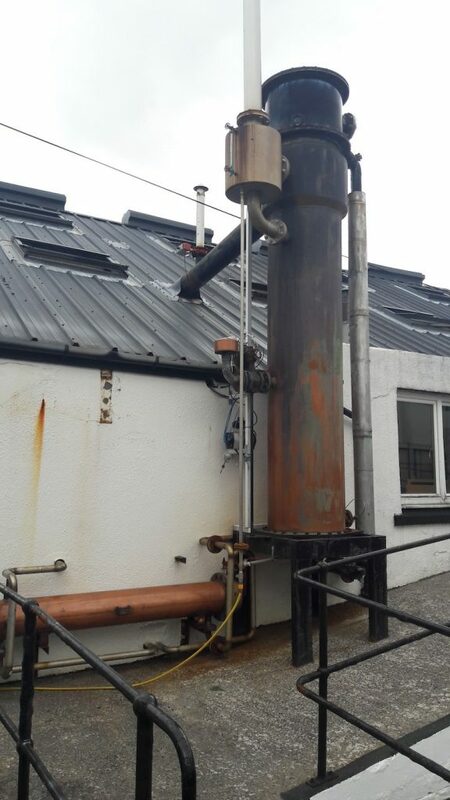 Photos Worm Tub from old still in Islay Museum and outside condenser at Bowmore Distillery.